Although it is widely known that regular exercise makes for a healthy heart, scientists believe they have shown why this might be. It encourages new blood vessels to grow to supply muscle fibres and ultimately switches the muscles into aerobic metabolism. Unlike anaerobic metabolism that uses sugar for energy, aerobic metabolism breaks down fat for energy. The Duke University team spoke at an American Heart Association meeting. The researchers studied what happened in mice when they exercised on a running wheel. 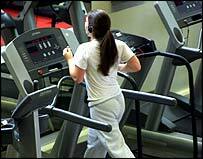 Exercise training stimulated the production of a protein called vascular endothelial growth factor (VEGF). VEGF encourages the growth of new blood vessels or angiogenesis. The number of capillaries supplying the exercising muscles increased and some of the muscle fibres that had been working anaerobically changed to work aerobically. Muscle in mammals is generally made up of two fibre types - slow-twitch fibres that need oxygen to work (aerobic) and fast-twitch fibres that can work without oxygen (anaerobic) by breaking down sugar. It's a question of optimising the whole system. Lead researcher Dr Richard Waters said: "What we have shown is that increases in the capillary density occur before a significant change from fast-twitch to slow-twitch fibre type, and furthermore, that the changes in levels of VEGF occur before the increased capillary density." The findings could be important for investigating the use of VEGF to treat diseases such as coronary heart disease and peripheral arterial disease where blood supply is inadequate, believe the researchers. Dr Maggie Brown, reader in cardiovascular physiology at the University of Birmingham said scientists, including herself, were looking at using VEGF in this way. "One of the problems is it will promote the growth of new blood vessels but these vessels are very leaky." She said it was important to have both a good blood supply and muscles that worked in the most efficient way. "It's all very well having blood vessels, but if you have not got the oxidative and aerobic enzymes to use the oxygen then you are in trouble. "So it's a question of optimising the whole system," she said.